Sprocket Gears! Spur Gears! Rack & Pinion! 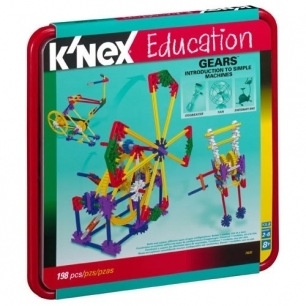 The K'NEX® Education Gears set is designed to introduce students to the scientific concepts associated with gears. Students are provided with the opportunity to acquire skills using a hands-on, inquiry-based approach to information and concepts as they build, investigate, discuss, and evaluate scientific principles in action. The Teacher's Guide provides the information and resources needed to build students' understanding of scientific concepts and channel their inquiries into active and meaningful learning experiences. Extension activities to explore the concepts more deeply are also included. Set includes 198 K'NEX® parts - enough to build 7 fully-functioning replicas of real-world machines, one at a time. Supports 2 - 3 students working as a team. Building instructions and comprehensive teacher's guide aligned to Science, Technology, Engineering and Math Standards included. Packaged in a strong storage tray with Snap-on lid. Grades 3-5. Sold by Gryphon House, Inc. Ships from Kaplan Early Learning Company.